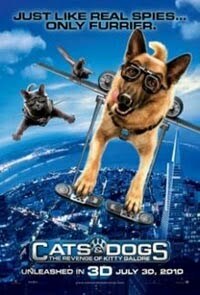 Cats & Dogs: The Revenge of Kitty Galore (2010), the sequel to 2001's Cats & Dogs is a heavily CGI-ed furry spies movie. Canine and feline lovers may love this movie. Parents will be delighted to bring their young children to cinemas to watch this clean and funny movie. I thought I would... till I watched all sorts of creepy CGI effects that animate the animals' speech, fight, flight, etc. This movie genre isn't something entirely new, especially if you've watched the 2001's Cats & Dogs and Marmaduke (2010), also a heavily CGI-ed movie about dogs.